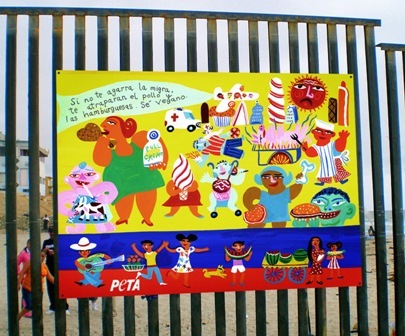 PETA sent a letter to Ralph Basham, the commissioner of US Customs and Border Protection, to convince him to offset the cost of building a border fence by selling ad space. Commenters said the traditional Mexican diet isn't meat-free, and the fence itself actually harms animals because it prevents wildlife from migrating for food. Well, I'm sure if PETA didn't need the fence for advertising and the US gov didn't need another lost cause to waste tax money on (because people in dire straits are really gonna go, "Hey, a fence" and turn back), everyone would be more than happy to take it down.